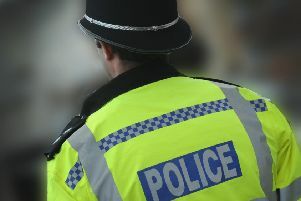 Police are hunting masked men who burst in on a couple while they were watching TV and stole cash and jewellery. The couple were forced to stay in their living room on Saturday 30 September while the theives searched their house. The incident occurred about 8.15pm in Hamilton Close in Worthing. When the men left, cash and jewellery - the latter of particular sentimental value - were found to have been stolen. The couple, in their 70s, were shaken but unhurt, police say. All the intruders were described as white, in their mid-20s, all clean shaven, all with short brown hair and between 5ft 9ins and 5ft 10ins tall. One had blue eyes and was wearing a baseball cap and grey anorak. A second was also wearing a baseball cap, bearing an NYC logo, and a dark scarf covering the lower part of his face. The third man wore a red and yellow mask or scarf over his face and was carrying a large Stanley screwdriver with a yellow and black handle. Detective Constable Jo Duncan, of Worthing Investigations, said: “Officers searched the area and carried out house-to-house enquiries. Anyone who saw or heard anything suspicious in the area on Saturday evening, or who may have other information of help to detectives, is asked to report details online or to phone 101, quoting serial 1241 of 30/09.